The sculptor who designed the bust of Cristiano Ronaldo unveiled at Madeira airport on Wednesday has defended his handiwork, saying: "Not even Jesus pleased everyone." The statue was presented to the public as part of the celebrations this week that saw the local airport renamed Aeroporto Internacional da Madeira, Cristiano Ronaldo, with the Real Madrid man in attendance at the event on his home island. The bust become a viral online sensation shortly after it was unveiled, with critics saying it bore little resemblance to the reigning holder of the Ballon d'Or, while social media was awash with memes ridiculing the design. Sculptor Emanuel Santos, however, has told Globo Esporte that he has not taken any of the derision to heart. "It's impossible to please the Greeks and the Trojans. Not even Jesus pleased everyone," he said. "This is a matter of taste, it's not as simple as it seems. I have seen the work of great artists that follow this parameter. What matters is the impact this work generated. "There is always the possibility of producing something that looks different, I was already prepared for all of that. I used some photos of Cristiano Ronaldo that I found on the internet as a base, not one photo specifically. I put the photos by my side and started working on the bust." Cristiano Ronaldo's bust was unveiled on Wednesday in Madeira. The sculptor who made the bronze bust of Cristiano Ronaldo has admitted that his creation may not be to everybody’s taste but insisted the Real Madrid striker had given his seal of approval before it was unveiled. Emanuel Santos, a Madeiran artist, was chosen to recreate the image of the four-time Fifa player of the year which will adorn the newly named Aeroporto Cristiano Ronaldo in Funchal after offering his services to the owner of the airport, where he was previously employed. Santos spent three weeks creating the bust before it was sent to the Portuguese mainland to be cast in bronze. It was then unveiled on Wednesday by Portugal’s president, Marcelo Rebelo de Sousa, and will be on permanently on show outside the terminal entrance. But while social media users delighted in pointing out that rather than looking like the 32-year-old Real Madrid forward the bust was a closer resemblance to the former Republic of Ireland striker Niall Quinn, Santos insisted he was happy with his creation. Ronaldo appeared to see the funny side at Wednesday’s ceremony but Santos was adamant that the 32-year-old had given the bust his blessing – after some minor alterations. The sculptor whose statue of Cristiano Ronaldo was ridiculed for failing to resemble the Portuguese forward has defended his work. Madeiran artist Emanuel Santos was commissioned to create the bust of Ronaldo, which took him three weeks to complete and he insisted both he and the Real Madrid star were happy with the end product. The Aeroporto da Madeira in Ronaldo's home town of Funchal has been renamed in his honour and the bronze bust was unveiled at a ceremony on Wednesday. That followed a decision by the Madeira regional government after Portugal won the 2016 European Championship, despite opposition to the move. Pictures of the bust were shared on social media, sparking disparaging comments about the workmanship. 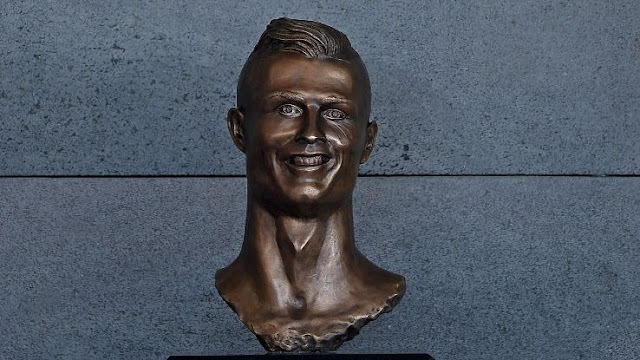 Some suggested it bore more of a resemblance to former Arsenal and Manchester City forward Niall Quinn, or The Head from BBC television programme Art Attack than Ronaldo. Mr Santos defended his work. He told Globo.com: "He only asked for some wrinkles that gave him a certain expression in his face when he's about to laugh to be changed. "He said it made him look older and asked for it to be thinned out a bit to make it smoother and more jovial. But they gave it the go-ahead and they liked what they saw." But Santos added: "It is impossible to please the Greeks and Trojans. Neither did Jesus please everyone. "This is a matter of taste, so it is not as simple as it seems. What matters is the impact that this work generated. There is always the possibility of making a difference, I was prepared for all this." 0 Response to "Cristiano Ronaldo bust sculptor: 'Not even Jesus pleased everyone'"